WASHINGTON — While cars become less popular with buyers, some manufacturers don’t bother building them anymore. Mazda isn’t one of them. While their crossovers prove more popular, they still show love for fun-to-drive sedans. Now the Mazda6 adds a new Signature trim level. Is it worth the extra cost? I’ve been a fan of the Mazda6 for a few years now; it’s a fun-to-drive sedan that has space for the family. But I wished for a bit more power under the hood, and Mazda has fixed that with the new 2.5L turbo engine on upper trim levels of the Mazda6. With 250 horsepower, this sedan is a much quicker ride than before when you use premium fuel. While the power is a welcome addition, the 310LB-FT of torque pushes you back in the seat when you mash the pedal. Fuel economy usually suffers with extra power, but I managed a respectable 25.6 mpg for a week of driving. You can use regular fuel but you only get 227 horsepower, but gas bills would be less. Handling is still a big attribute of the Mazda6 with an all around fun-to-drive experience. Corners are fun to tackle and the daily commute isn’t tiresome either. Mazda has reworked the suspension to take out some harshness on rougher road surfaces in the previous models. Mazda uses something called Skyactiv-Vehicle Dynamics with G-Vectoring Control, which helps make the FWD sedan handle more like a sporty car with rear wheel drive. An automatic is the only transmission available with this turbo power — a shame as Mazda doesn’t make a manual an option. New this year is a swankier version called the Mazda6 Signature which moves the midsize sedan upscale. Moving upscale isn’t cheap. It’s about $36,000 for this loaded sedan which seems to be the going rate for a top trim-level midsize sedan these days. For that price, you get one of the nicer interiors in the class with Nappa leather; it’s usually found on more expensive luxury vehicles. The front seats are heated and ventilated and seem to offer more comfort than in previous Mazda6 versions I’ve driven. With Active Driving Display, the information needed shows up in the windshield. The finishes are top notch with soft touch materials and real wood trim. The Deep Chestnut color is rich and a welcome departure from black or gray like you see in most cars. The space in the back seat is just fine, though some competition offers more leg and head room. I fit back there with no problem. The latch system is easy to reach with the handy covers marking the location. The NAV is standard on this trim level and the 8-inch touch screen is easy to use. The controls on the center console for volume and the larger central control knob take some getting used to. The Mazda6 Signature is a handsome sedan with a little change this year. The larger front grill doesn’t seem to lean forward like it did before. The front end styling is very clean. The Adaptive LED headlights are slim and modern looking. I’m not used to seeing a front end that isn’t all grill. It’s refreshing to see the body color up front! Large 19-inch wheels fill out those bulging wheel openings. The side view shows off the cool flowing lines. The roofline seems to mimic a coupe more than a family sedan. Those clean lines flow to the back end with a tasteful small spoiler on the short trunk lid. The optional Soul Red Paint seems to work well with this car. The new Mazda6 Signature is the midsize sedan that seems to have punch above its paygrade. 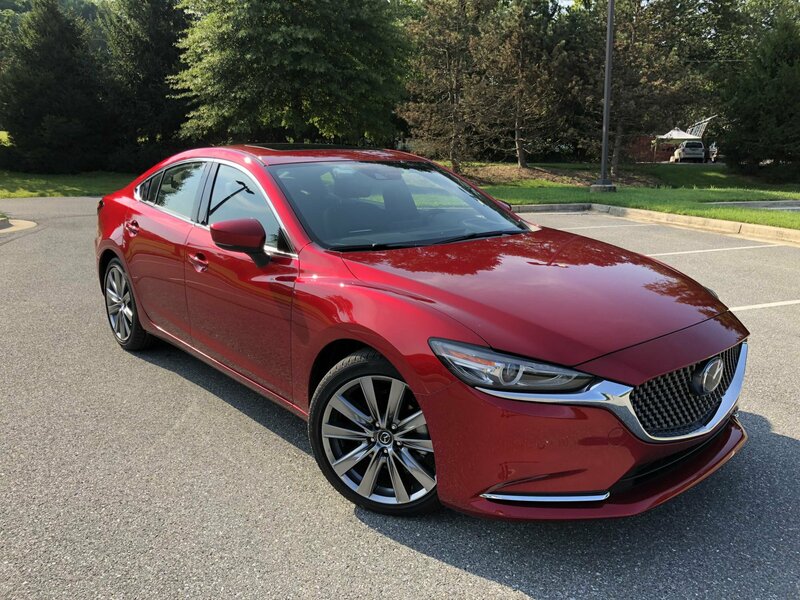 With a premium interior and newfound power, the Mazda6 was fun to drive, and now the Signature model makes a really good all-around sedan.